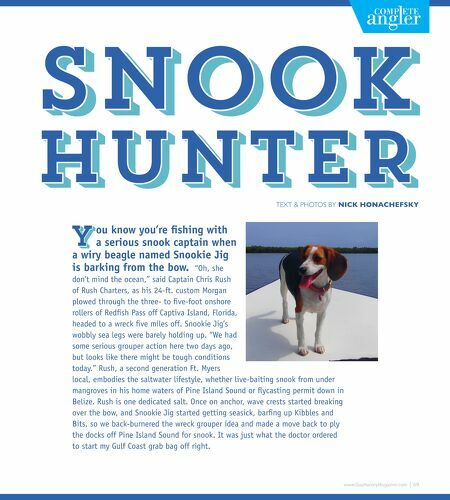 SNOOK HUNTER TEXT & PHOTOS BY NICK HONACHEFSKY Y ou know you're fshing with a serious snook captain when a wiry beagle named Snookie Jig is barking from the bow. "Oh, she don't mind the ocean," said Captain Chris Rush of Rush Charters, as his 24-ft. custom Morgan plowed through the three- to fve-foot onshore rollers of Redfsh Pass off Captiva Island, Florida, headed to a wreck fve miles off. Snookie Jig's wobbly sea legs were barely holding up. "We had some serious grouper action here two days ago, but looks like there might be tough conditions today." 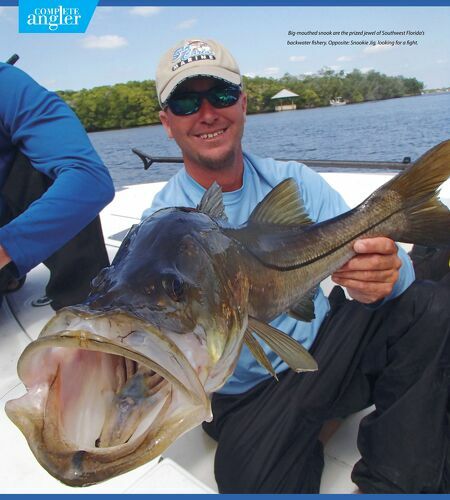 Rush, a second generation Ft. Myers local, embodies the saltwater lifestyle, whether live-baiting snook from under mangroves in his home waters of Pine Island Sound or fycasting permit down in Belize. Rush is one dedicated salt. Once on anchor, wave crests started breaking over the bow, and Snookie Jig started getting seasick, barfng up Kibbles and Bits, so we back-burnered the wreck grouper idea and made a move back to ply the docks off Pine Island Sound for snook. It was just what the doctor ordered to start my Gulf Coast grab bag off right.